Long-time readers of this blog (there are some, aren’t there...?) will know that I’ve developed a minor obsession with seeing how long I can use emergency food and water past their expiration dates. That’s not as wacky as it sounds, since most “expiration dates” on food are normally "use-by dates," and are actually “best-by dates," arrived at by a variety of approaches that have nothing to do with them becoming harmful to health. Tossing and replacing good food and water is wasteful of money and effort. Still, some supplies really do go bad, so it’s worthwhile to figure out where to draw the line. I’ve already told readers about the FDA’s statement that you can ignore the expiration date on sealed, commercially bottled gallon water jugs, and I’ve determined and reported that MREs (Meals Ready to Eat, a popular kind of military and emergency relief ration) are as good as a can of Hormel chili even after a decade and a half, 7 years after their theoretical best-by date. However, in addition to gallon water jugs and MREs, I have additional emergency supplies in the form of US Coast Guard-approved emergency water envelopes (125 ml; 4.3 FL. oz.) and “Survival food packets” (also listed as "Emergency Food Rations") from S.O.S. Food Labs, Inc. that are single-serving meals in the form of good tasting fat, sugar, and protein. Both of these are good for storage in portable go-bags, in the car, and at work due to their light weight and compact size. I purchased both kinds of rations some time around 2006-2007, I think, and they each had manufactured dates of 2005 and expiration dates of 2010. I put them in my portable emergency kit at home, in my office at work and in my UCSF lab, and in my car, and forgot about them for a while. The fact that two completely different kinds of emergency supplies from the same company both have the exact same stated shelf life should already suggest to us that these dates are somewhat arbitrary, and I have interpreted them loosely. Since the car is sometimes out in the hot sun, I have been good about periodically replacing the food and water in the car (more on this below), but the supplies at home and work just sat there, and in early 2016, I realized that I should probably check them. It seems that my earlier successes with eating expired supplies have apparently made me a bit overly confident! Let’s start with the water envelopes. These are silver colored packets that, according to S.O.S. Food Labs, are plastic-lined aluminum packets (tri-laminate foil film structure; see figure on the right). The S.O.S. rep also told me that the plastic lining is BPA-free, which puts this water in a similar situation to water that has been commercially bottled, unopened, in the BPA-free gallon jugs as in my earlier article about being able to ignore that expiration date. These envelopes are truly indestructible. I haven’t pushed it to the max, but you can put a good bit of pressure on the envelopes and they don’t burst or leak. S.O.S. tells me that they have an average burst in foot lbs of 862. As a testament to the twisted sense of humor of those who created them (or perhaps a testament to those people having fingernails and teeth like razor blades), there is a little notch at one corner of the envelope that says “tear here.” But you can’t tear there. You can’t tear anywhere. If you cut a real notch with scissors or a knife, you still can’t tear there. Only by slicing or cutting the envelope completely open can you get at the water inside, so if you get stranded somewhere with these water envelopes and no knife or scissors or vampire, I’m afraid you’ll probably perish. But the water won’t perish. I opened it using the extreme method above, and found the water to be just fine. Perfectly clear, no odor, and only the slightest stale flavor that is expected in water that has sat for a long time and can be removed by aerating the water; just expose it to air and shake it. There was only the slightest hint of that taste, even 6 years after the "expiration date." Therefore, since the water rations cost a lot and are heavy to ship, I opted to keep those water envelopes for emergencies for the foreseeable future. Even if there was the slightest bit of some unknown chemical leaching in the water in small amounts, I feel ok about using such water for a few days or weeks in an emergency, even if I wouldn’t necessarily want to live on the stuff on a daily basis. On the other hand, I had mixed results with the food bars. These are high-fat intentionally and have a lot of sugar; there are many ways in which they could go bad by having something grow in them or having the fat go rancid. MRE rations are good for much longer than their best-by dates suggest (see my articles about the expiration date actually being based on subjective opinions by taste testers and my subsequent article describing my enjoyable experience eating a 14-year-old MRE), but these S.O.S. food rations are not MREs and might not be as stable. Many of my packages are dated 2010-2015, but I had four 2005-2010 packages in the lab, each containing 9 bars. I noticed that three of the four packages were still tightly vacuum packed, but the fourth one had ballooned out a bit. The one that ballooned out a bit had an "old cooking oil" smell that you also find in old nuts, and had probably oxidized, so I discarded it. New bars taste kind of like peanut butter and sesame and are very sweet (if you click on the first photo to enlarge it, you can see the actual ingredients). However, I opened one of the expired but still-vacuum-packed packages and sampled a bar, and found that while it smelled fine and it still tasted ok, it had the slightest old flavor as an after-taste. I'm sure they are still good in an emergency but I decided to order replacements for the 2005-2010 food bars just in case. Still, these are 11 years old and 6 years past their printed use-by date, so I’m guessing it’s reasonable to keep them around for about 10 years before replacing them. I was pleasantly surprised, however, when I replaced the 2010-2015 bars that were in my car and opened the old one. These were fine under controlled temperature conditions, but I had assumed that with frequent baking in the hot sun, the bars stored in the car would go bad very quickly. Not at all; the package was still tightly vacuum-packed, and the bars inside were just as good as the 2010-2015 bars that had been stored indoors. There was one little section of the bar that was more solid than the rest and hard to bite through, but it all tasted so good that I admit I finished off the rest of it as a late night snack! Then I thought about the presence of vegetable shortening in the ingredients, which for something manufactured in 2010, certainly means partially-hydrogenated oils, and decided not to snack on the remaining eight bars in that opened package for casual use. I can live with a bit of trans fats for a few days after a regional emergency. As long as the packaging is intact and there is no extra air, a food product in which nothing has grown in 5 years should not spawn life during the subsequent 5 years. It's always possible that some spore could be in there that takes over 5 years to activate, but I think that is unlikely. I also presume that if chemicals haven’t leached out of the packaging over 5 years and the product is not stored in the heat or light, it’s doubtful that chemicals will leach out into the food in the subsequent 5 years to an unhealthy extent for temporary emergency use. I’m presuming that if it doesn’t taste or smell bad, then the worst risk of eating it is that the culinary experience won’t be ideal. However, I don’t have the authority to officially pronounce food to be safe, although I’m pretty confident of the logic and you can draw your own conclusions. Similarly, it is my OWN opinion that the envelope water will be fine for much longer than the use-by date. My information about ignoring the use-by date on unopened bottled water comes straight from the FDA, so I can confidently repeat it to my readers. In contrast, the use of “expired” water ration envelopes is my own conclusion from the evidence and you can draw your own conclusions from what I’ve reported here. In both cases, I take no responsibility if you sample vintage rations and grow a second nose. Hi. I have an entire lot of food bars and water packets that expired in 2014. Expensive stuff and really not wanting to toss it all. It is that coast guard approved mayday stuff. Thoughts? Thanks! Well, if the water packets are the same ones mentioned in this article, I would think they are fine. Remember that I found the ones dated with a best by date of 2010 to be good, so those dated with best by of 2014 should be good as well. For the food bars, if the same ones as referenced in the article, the ones I had with a best by date of 2015 were good, even if having been in the hot sun; and the ones with best by date of 2010 were basically good but with a slight annoying aftertaste. It follows then that those with best by date of 2014 should be good. Remember that in both cases, my caveat in the article still applies; I don't have the authority to officially pronounce food to be safe after a best by date, but my personal experience suggests that it is. As a bit of advice I had a pack of water and food that was approaching it's "end of life" they had about a year to they expiry date. And like you described I had 1 food pack that was ballooning. I contacted the manufacturer who not only sent a new food pack they sent me new food and water packs. I did send the 1 bad pack back to them but well worth it. Thanks for a very informative blog! My husband and I were updating our earthquake kits. The water packets had just reached their expiration date and we were wondering how water could possibly "expire." This was enormously helpful. We have a box of MREs that are expired. Do you know if there is a way to donate them? Seems like a waste, but husband bought new ones, and there's no space to keep these expired ones. I had that exact water packet in my backpack which i wear all the time, and when i checked on it one day, it was empty. So i replaced my packets with Nalgene-type bottles, refilled every 6 months (using a reminder app). In my backpack, i have a "hip flask" for emergency water. They're cheap on Ebay, and pretty light. That’s rather distressing; if the packet was empty, wouldn’t that mean the water leaked out into your backpack? Wouldn’t that have been rather difficult to miss...? It's only 125 mL, and it was in a rarely-opened compartment in the backpack, so a slow leak from a puncture could have easily gone unnoticed - especially in the rainy season. I no longer trust any soft-sided containers for emergency water. Nalgenes & hip flasks work great and are refillable (unlike packets). I started using milk crates to protect my 1 gallon supermarket water bottles (they hold 4 perfectly). By the way, thanks for your efforts on educating the public. All good points. 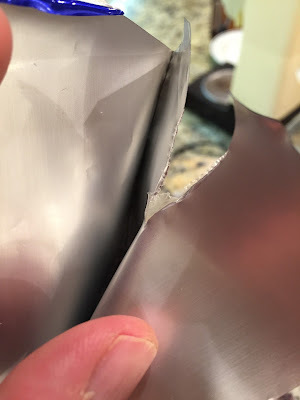 The envelopes are actually pretty tough, but if they were going to be in something that gets jostled a lot, this could increase the risk of failure, even slow failure. Mine are in stationary storage, which helps. Thanks for the comments! I have around 75 Datrex Waters pouches that have been in the back of my closet. They expired in April 2017, are they safe to drink? Thanks. Since these envelopes contain only water with no source of nutrients for any growing organisms, and probably not even air, my view is that no contaminants are going to be there after 5 years that weren’t there in the first day. The only things I can see going wrong with time are if something from the lining leaches out that is either bad for you or good for contaminating pathogens (which seems highly unlikely based on what we’ve read about other similar water products), or if the envelope springs a leak as apparently happened to an earlier commenter for this article. That is going to be a rare problem though, and of course, you will know it if that has happened so you wouldn’t be drinking that water anyway! As always, I feel it necessary to refer people back to the final paragraph of the main article and to note that I don’t have the authority to pronounce food or water to be officially safe; I can only report what authorities are saying, and point out common sense arguments that people can use to make their own informed decisions. It would be unwise for me to guarantee that people won’t have problems, but I think the logic here is reasonable. Thank you with all your help with packaged water and ration bars...I am pretty familiar with MRE's as I was in the military. Under ideal conditions they can at least double their storage life with no real change in quality...condiments and cheese sauce and peanut butter tend to go bad sooner. Thanks for that comment; it's always good to get independent confirmation. Oops sorry, I was reading a bunch of your articles on MREs too, so thought I was commenting on one of those. Could you explain when you choose to keep MREs vs. these bars? MREs seem so much more expensive... but I suppose have a lot more variety. I am wondering if I can just rely on my stocked pantry and keep some of these around for backup (plus some for at work). Thanks for all the tips! similar question for jugs of water vs. the water packets? First of all, I'm glad someone is reading my MRE articles :-) Well, MREs are complete warm meals, whereas those SOS bars are more like Powerbars on steroids; just a brick of actually quite good-tasting stuff but "stuff" all the same. You'll get your nutrients from MREs and from SOS bars, but I suspect you'd be happier eating MREs for a week than eating SOS bars for a week. However, the SOS bars are more compact, with no space wasted for packaging and accessories, and are great for stashing in tighter spaces like at work and in a car, places that one hopes you would not be stuck for a week. Sure, as I mentioned initially, having a well-stocked pantry that is always stocked gets around the need for emergency food, except in the much less likely event that you'll need to go to a shelter, in which case the stuff in your pantry won't travel as well. It's a personal decision. I certainly get busy enough sometimes that I let my level of normal food in the home get down to the point that I really need to go to the store. Regarding the water, I have water jugs (convenient) in my home, and I have those envelopes of water in my car and at work and also in my mobile emergency supply kit, since they are much easier to pack than water bottles. this may be a stupid question, but if you keep a stocked pantry for cooking anyway, is canned food ok? It's not a stupid question at all. If you kitchen is well-stocked, then that should take care of your food needs for several days easily (assuming you don't have to leave). Water may be a concern, but if you know the earthquake will happen when the pantry is well stocked, you are probably in good shape. However, if you happen to need to go get groceries and then the quake hits, you are out of luck. At least having emergency food ensures that you'll be fine regardless of where you are in the grocery shopping cycle. But cans are fine if they are being used up every year or two. Not sure; I don't think I have experience specifically with the Datrex. By a Google image search, they look pretty similar to the SOS food bars I have and are probably similar composition. But based on my experiences above, I am going to guess that it's probably best to replace them. Certainly if they are not tightly vacuum packed, get rid of them, but even vacuum packed with no inflation, mine were just starting to have that slight off taste when older than 10 years.